Last night, IP Inclusive was awarded the inaugural Corporate Social Responsibility Award at the prestigious Managing IP Awards. The annual event, which took place at The Savoy in central London, saw over 250 IP professionals celebrate successes and achievements within the international IP world. Among the accolades this year was Managing IP’s first ever Corporate Social Responsibility Award, presented to IP Inclusive for its work in uniting professionals throughout the IP world in the pursuit of greater diversity and inclusivity. Andrea Brewster, ‎Immediate Past President of The Chartered Institute of Patent Attorneys (CIPA) and founder of the IP Inclusive movement, collected the award, commending Managing IP for making corporate social responsibility “one of the benchmarks by which we can both measure and celebrate progress in the IP professions”. 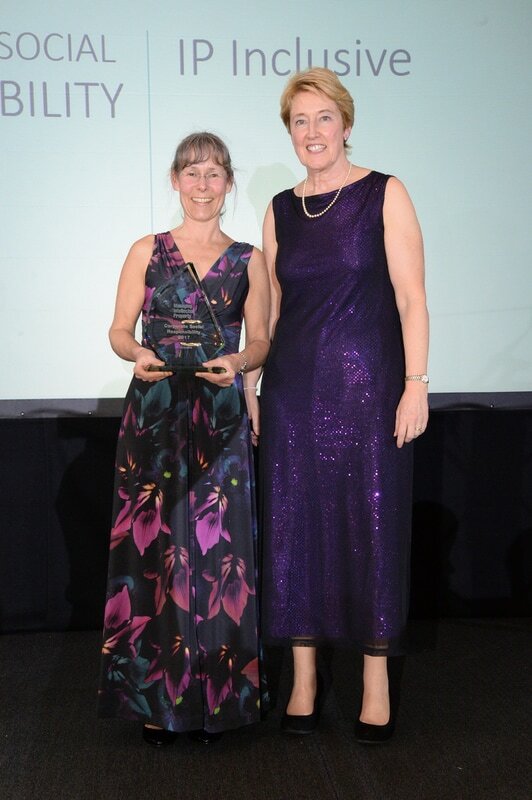 Andrea commented: “I am thrilled to accept this year’s award on behalf of everyone who has worked so hard to establish and grow the IP Inclusive community over the last couple of years. IP Inclusive has been a catalyst for change but we have also had incredible support from our founding organisations CIPA, CITMA, FICPI-UK, IP Federation and the UKIPO, and from a huge array of volunteers across the country. We are proud to have launched so many inclusivity initiatives, such as support and networking groups, events, learning resources, careers information and a community of signatories to our Equality, Diversity and Inclusion (EDI) Charter. My thanks to every single person who has chosen to become involved and thanks to Managing IP for recognising everyone’s efforts. I know that this award will spur us on to still greater things”. Lesley Evans, Chief Executive of European IP firm, Haseltine Lake and leader of the IP Inclusive Charter initiatives also spoke at the presentation, urging the audience of international IP practitioners to spread the word about IP Inclusive in their own jurisdictions. Lesley commented, “This has been an extraordinary week for IP Inclusive. Not only have we celebrated our 100th signatory to our EDI Charter, but now we have received this amazing and unexpected award, which recognises the importance of increasing diversity across the IP professions. The IP professions are generally very open and welcoming, but they can be stronger and better still if they reach out and make themselves known to the widest possible workplace demographic. IP Inclusive is giving us the tools and the impetus to do just that”. Congratulations on the award, what great recognition. Keep up the good work and we're happy to support you in all your efforts.